Crafted World clings to the familiar premise of languid 2D platforming, schmaltz overload and a colourful landscape constructed from bits of milk carton, rolls of paper, sticky tape and miles of string. The twist here is that there is no twist. Nintendo led us to surmise the levels could be flipped at will, revealing the reverse of the scenery and creating multi-dimensional puzzles in the mode of Paper Mario. But these scenery swaps occur at only very specific points and amount to little more than indulging the completionist seeking 100pc of the collectibles. That's not to say YCW lacks for fun. The mild challenge and co-op gameplay makes it ideal for younger gamers. All but the stoniest of hearts will be wooed by the charming animations, tunes and intricate dioramas. Some novel notions eventually come to the fore in the form of, for example, stealth sections and amusing ideas such as firing cannonballs by pounding a foot pump. 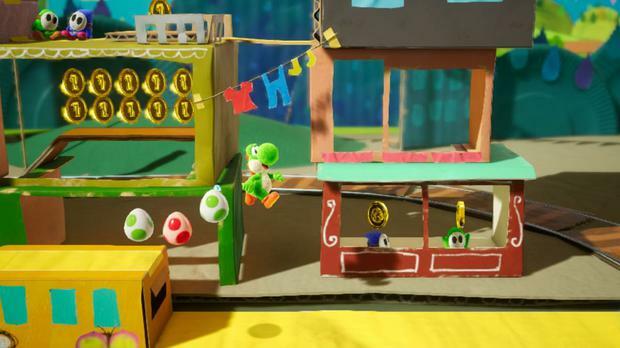 Overall, though, there's a throwaway, repetitive feel to Crafted World, one that prevents Yoshi from joining the top tier of Nintendo's classic mascots. Write about what you know, they say. Evidently, the team at Avalanche in Stockholm figured an open-world post-apocalypse shooter set in 1980s Sweden made sense to them. This is a curious amalgam of survival shooters such as DayZ and exploratory-themed meanderings such as The Vanishing of Ethan Carter, in which a lone survivor wanders through abandoned islands populated only by belligerent robots. Always outnumbered, frequently outgunned, you come to appreciate GZ's nihilism and stark beauty. But you'll also chafe at its technical glitches and relatively empty world that does little to pull you to its narrative threads. It functions best as a four-player co-op experience, where the mechanical enemies pose less of a threat and the loneliness of the landscapes is replaced by a sustaining camaraderie that fills the substantial gaps in its storyline. Ronan Price Poetry in motion encapsulates the DMC formula but never so much as in this sixth (yes, sixth) in the series. DMC5 returns to the roots of the gothic fantasy brawler after a divisive 2013 reboot.